- Mix the goat cheese with the chopped pistachios, cranberries, cinnamon, and salt. 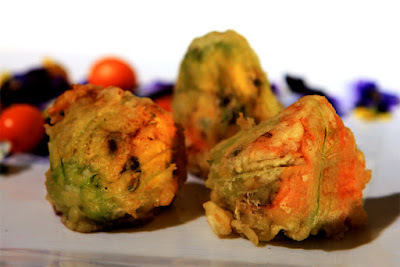 - Place about a tablespoon and a half of the mixture in each zucchini flower (more or less, depending on their size). - Mix one cup of tempura batter with 1 cup of ice cold water (or whatever ratio is indicated on your tempura batter mix package). If you can't find the tempura batter, mix instead a large egg with one cup of mineral water, half a cup of flour, and half a teaspoon of baking powder. - Heat some oil in a cooking pan - use high heat. - Roll each stuffed flower in the tempura batter to coat, the gently slide it into the oil. Cook only a few at a time, and make sure they don't stick to one another. - When ready (the tempura butter is crisp), place each fried flower on a paper towel to drain the extra oil. Serve immediately. - One idea is to stick to a fruits and flowers presentation for this delicious appetizer. For example, I served the tempura blossoms next to a bed of pansies and kumquats.